Few things are worse than having to listen to monotone speakers. Their voices drone on and on without emphasis or colour. Few things are more sleep inducing, no matter how interesting the subject matter. You have several vocal tools available to make your delivery more engaging. Use your voice as if it were a musical instrument. Find moments when it’s appropriate and funny for your voice to be spoken at a high pitch and others when it is appropriate to use a low pitch. For instance you could say this in a number of ways: “You want to do what?” If you put emphasis on the word “what” by making it high pitched, it would communicate a humorous sense of dread. If instead you put the emphasis on the word “you” by making it low pitched, it would communicate a sense of anger. Sometimes you may slowly raise or lower your pitch with each word in a sentence, ending with a particularly dramatic high or low note. If you were to say “You want me to do what?” while your voice went from high to low, it would tend to sound sarcastic. Vocal volume is a joke teller’s best friend. It makes it possible to clue people into key moments in your joke by turning up the volume on certain words. So when the punchline comes, they are prepared for its full glory. “I WANT the cookie. Give ME the cookie. COOKIE, COOKIE, COOKIE!” If you made the all-capped words particularly loud, you would be exercising comic exaggeration. One of my favourite moments of comic understatement happens in My Little Pony: Friendship Is Magic. One character who is known to be soft spoken is asked to cheer loudly. She does a vocal wind-up as if she is going to be thunderously forceful, then out comes “yay” in a tiny voice. “Too loud?” she then asks. A soft voice is also good to indicate vulnerability and sadness. These are crucial to good comic timing. When I teach joke telling to primary/grade school kids, I have them say the first half of the joke, have the audience do a count down “3-2-1”, then they say the punchline. This teaches them to pause and give the audience a chance to feel some anticipation. A slow delivery with many pauses is often done to enhance the drama of a piece. Each word seems to be carefully thought out before spoken, giving them more weight. William Shatner is often teased for his Shakespearean manner of regularly pausing dramatically. When I was a member of the forensics club at high school, I was taught to mark up my speeches. In this way I would rehearse not just the words of my speeches, but the way in which they would be said to give them the most consistent power. 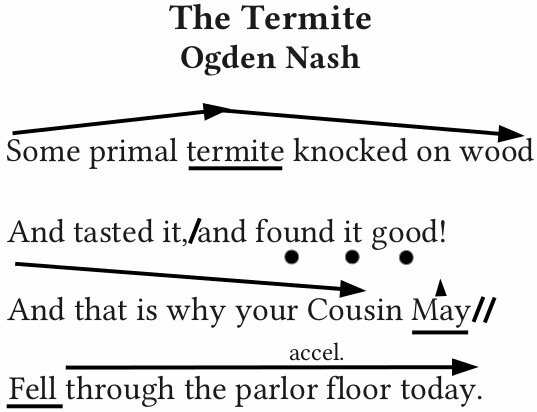 Here is how I might have marked up The Termite. The arrowed lines indicate whether my voice is inflecting up or down over entire sentences. An up or down arrow over a single word indicates higher or lower pitch for that word. Underlines indicate where I should be speaking more loudly. A slash indicates a pause. I routinely used up to three slashes to denote the length of the pause. Dots under words meant I was to pronounce each word distinctly in a staccato fashion. A horizontal line with the word accel. over it meant I was to speak more quickly through a particular passage. I didn’t have much call for the whisper, because we weren’t given microphones; perhaps a wiggly underline. Don’t be afraid that you’ll sound silly being this expressive. It’s more natural sounding than you realise, and besides you’re in the business of being silly. Give it a try, see how you go.